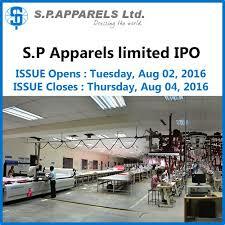 S. P. Apparels Limited (the “Company” or the “Issuer”) proposes to open on August 2, 2016, an initial public offer of Equity Shares of face value of Rs. 10 each (“Equity Shares”) for cash at a price band from Rs. 258 to Rs. 268 per Equity Share consisting of a fresh issue of Equity Shares aggregating up to Rs. 2,150 million (the “Fresh Issue”) and an Offer For Sale of up to 900,000 Equity Shares (“offered shares”) by New York Life Investment Management India Fund (FVCI) II LLC (the “Selling Shareholders and such offer of equity shares by the selling shareholder, the “Offer for Sale”). The Fresh Issue and the Offer for Sale are together referred to as the “Offer”. The Offer will close on August 4, 2016. Bids can be made for a minimum of 55 Equity Shares and in multiples of 55 Equity Shares thereafter. The Company, in consultation with the Selling Shareholder and the Book Running Lead Managers (“BRLMs”), may consider participation by Anchor Investors. The Anchor Investor shall bid on the Anchor Investor Bidding Date; i.e. one Working Day prior to the Bid / Offer Opening Date. The BRLMs to the Offer are Motilal Oswal Investment Advisors Private Limited and Centrum Capital Limited. The Equity Shares offered through the Offer are proposed to be listed on BSE Limited (“BSE”) and National Stock Exchange of India Limited (“NSE”). The Offer is being made through the 100% Book Building Process in compliance with Regulation 26(1) of the Securities and Exchange Board of India (Issue of Capital and Disclosure Requirements) Regulations, 2009, as amended (the “SEBI ICDR Regulations”), wherein not more than 50% of the Offer will be allocated on a proportionate basis to Qualified Institutional Buyers (“QIBs”) (the “QIB Category”), provided that our Company and the Selling Shareholder may, in consultation with the BRLMs, allocate up to 60% of the QIB Category to Anchor Investors on a discretionary basis in accordance with the SEBI ICDR Regulations (the “Anchor Investor Portion”), of which one-third will be reserved for domestic Mutual Funds, subject to valid Bids being received from domestic Mutual Funds at or above the Anchor Investor Allocation Price. Further, 5% of the QIB Category (excluding the Anchor Investor Portion) will be available for allocation on a proportionate basis only to Mutual Funds, and the remainder of the QIB Category will be available for allocation on a proportionate basis to all QIBs (other than Anchor Investors), including Mutual Funds, subject to valid Bids being received at or above the Offer Price. Further, not less than 15% of the Offer will be available for allocation on a proportionate basis to Non-Institutional Investors and not less than 35% of the Offer will be available for allocation to Retail Individual Investors in accordance with the SEBI ICDR Regulations, subject to valid Bids being received at or above the Offer Price. All Bidders, other than Anchor Investors, are required to mandatorily utilize the Application Supported by Blocked Amount (“ASBA”) process providing details of their respective bank accounts which will be blocked by the Self Certified Syndicate Banks, to participate in the Offer. Anchor Investors are not permitted to participate in the Offer through the ASBA process. S. P. Apparels Limited is a leading manufacturer and exporter of knitted garments for infants and children in India. These are manufactured at their integrated facilities that allow them to provide end-to-end garment manufacturing services from greige fabric to finished products. The business consists of two main divisions – (i) garments division (for manufacture and export of knitted garments for infants and children); and (ii) retail division (for manufacture, distribution and marketing of products in India under the brand name ‘Crocodile’). The Company is led by Promoters, who are first generation entrepreneurs and have over the years grown the business of the Company to become the second largest exporter among manufacturers of knitted garments for infants and children in India in terms of revenue in the Fiscal Year 2014. (Source: Technopak Report). For Fiscal Year 2016, the Company exported approximately 35.98 million pieces of knitted garments for infants and children directly to international customers, including TESCO and Primark. The Company’s 21 operating manufacturing facilities and the manufacturing facility at Netaji Apparel Park (NAP) (which the Company is in the process of being established), are located in and around the region of Avinashi, Tamil Nadu. On a restated consolidated basis, the Company generated total revenues of Rs. 5,377.54 million for Fiscal Year 2016 with a net profit of Rs. 347.14 million achieving a Return on Networth of 30.80% for equity shareholders. S.P. Apparels Limited is proposing, subject to receipt of requisite approvals, market conditions and other considerations, to make an initial public offer of its Equity Shares and has registered the RHP with the RoC, on July 21, 2016. The RHP is available on the websites of SEBI and Stock Exchanges at www.sebi.gov.in, www.bseindia.com and www.nseindia.com, respectively, and is also available on the websites of the Book Running Lead Managers at www.motilaloswalgroup.com and www.centrum.co.in. Potential investors should note that investment in equity shares involves a high degree of risk and for details relating to the same, see "Risk Factors" beginning on page 14 of the RHP. Potential investors should not rely on the DRHP filed with the SEBI for making any investment decision. The Equity Shares have not been and will not be registered under the U.S. Securities Act of 1933, as amended (the “U.S. Securities Act”) and may not be offered or sold within the United States (as defined in Regulation S of the U.S. Securities Act), except pursuant to an exemption from, or in a transaction not subject to, the registration requirements of the U.S. Securities Act and applicable state securities laws. Accordingly, such Equity Shares are being offered and sold outside of the United States in offshore transactions in reliance on Regulation S under the U.S. Securities Act and the applicable laws of the jurisdiction where those offers and sales occur.